Diversity Array Technology (DArT) markers were used to investigate the genetic diversity, population structure, and extent of linkage disequilibrium (LD) on a genome-wide level in Canadian barley (Hordeum vulgare L.). Approximately 1,000 DArT markers were polymorphic and scored with high confidence among a collection of 170 barley lines composed mostly of Canadian cultivars and breeding lines. The reproducibility of DArT markers proved very high, as 99.9% of allele calls were identical among seven replicated samples. The polymorphism information content (PIC) of DArT markers ranged between 0.04 and 0.50 with an average of 0.38. Using principal coordinate analysis (PCoA), most lines fell into one of two major groups reflecting inflorescence type (two-row versus six-row). Within these two large groups, evidence of geographic clustering of genotypes was also observed. A cluster analysis Unweighted Pair Group Method with Algorithmic Mean suggested the existence of three subgroups within the two-row group and four subgroups within the six-row group. An analysis of molecular variance (AMOVA) revealed highly significant (P < 0.001) genetic variance within subgroups, among subgroups, and among groups. Values of LD, expressed as r 2, declined with increasing genetic distance, and mean values of r 2 fell below 0.2 for markers located 2.6 cM apart. Approximately 8% of marker pairs located on the same chromosome and 3.4% of pairs located on different chromosomes were in LD (r 2 > 0.2). Within both the subsets of two-row and six-row lines, LD extended slightly further (3.5 cM) than for the entire set, while 7.5% of intra-chromosomal locus pairs and <2% of inter-chromosomal pairs were in LD. 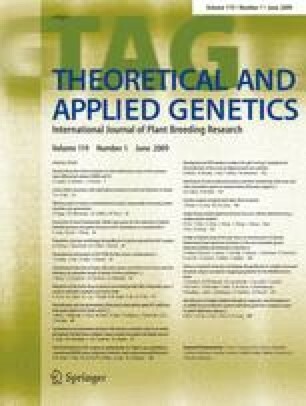 We discuss the implications of these findings with regard to the prospects of association mapping of complex traits in barley.